Los Angeles - In the wake of Kurt Cobain's suicide and Nirvana's consequent demise, few observers predicted that the surviving members of the band - Dave Grohl and Krist Novoselic - would resurface in any significant way. Cobain, after all, was plainly Nirvana's creative core and focal point; Grohl and Novoseliic were expected to politely slip into obscurity, becoming mere footnotes in one of rock music's most significant chapters. Granted, Novoselic's profile has been low. The gangly bass guitarist has occupied himself with political causes, and his new band Sweet 75, is only now beginning to emerge and has yet to make any noticeable noise. But Grohl wated no time in giving notice that he was anything but the cliched rock drummer mindlessly bashing away behind the kit to step to the fore, guitar in one hand and mike in the other, to lead his own band, Foo Fighters. 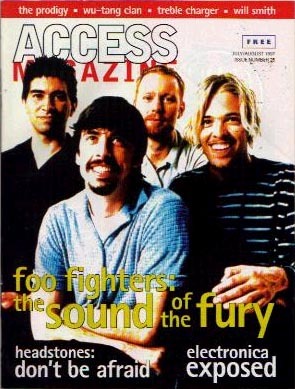 With the intense scrutiny of his first post-Nirvana project out of the way, Grohl's next hurdle is to answer this question: Was the success of the first Foo Fighters record a fluke? Recording this time as a unit, singer/guitarist Grohl, bassist Nate Mendel, guitarist and former Nirvana sideman Pat Smear, and drummer William Goldsmith (since replaced by Taylor Hawkins) have come up with a convincing sophomore effort, one that largely remains the punk spirit of the first release while raising the bar several notches higher in terms of production and overall sound thanks to Gil Norton (The Pixies, Counting Crows). 'The Colour And The Shape' confirms Grohl's knack for writing infectious tunes that drip with energy, melody, hooks and attitude. The kid - Grohl is 28 - obviously has the goods. Bounding into an office of the famed Capitol Tower in Hollywood (a round building designed to look like a stack of 45s) on the eve of the album's release, the newly coiffed and goateed musician possesses the boundless energy of his songs. He's exuberant and positive and, unlike Foo Fighters' first go-round with the press two years ago, eager to talk. With this new album, I understand you took a fair bit of time in the studio as opposed to doing it really quickly? The first record took five days. This one took about three months or something. Well actually, not really. It took probably a month and a half or two months. I mean, we spent a month in pre-production, which is basically just rehearsal, arranging the stuff. We spent a lot of time with Gil, the producer, kind of going over the arrangements and melodies and harmonies and stuff like that. So yeah, we paid a lot more attention to this one than we did the last one. Why did you take such a different approach? Well, because the first one I did myself. This one was all of us in the studio recording together, and it just seemed like, instead of going into a studio and producing it ourselves and doing another sort of basement recording, it wouldn't have done the songs justice. We wanted to get someone like Gil to produce it so there'd be some clarity, so you could hear every single guitar overdub, every single vocal harmony and everything we'd added to the song we wanted to be there - not just have it be a big mess. I read a quote where you said you wanted it to sound like a Queen record. Is that coming back to haunt you? Not really. We didn't want it to sound like a Queen record. Well, I'm sure Pat did because he's pretty into Queen. And our new drummer, he's totally into Queen. Like, they're obsessed, They're almost stalkers. It's kinda weird. But no, I just sort of meant, instead of going in and making the sort of grungy, garage-y record (that everyone expected), we just wanted to make a proper rock record. And then the next album will sound even bigger than this, and the next one will sound even bigger than that. So that's kind of what I meant when I said it's gonna sound like a Queen record. It does sound like a Queen record in relation to the first record. Because of your pedigree, do you think you're especially vulnerable to people criticizing you for wanting to make a good-sounding record? Well, who wants to do the same thing for the rest of their lives? Like, I've never made a big rock record. And I'll do anything once. Sure, I'll go in and spend tons of money and tons of time making an album. Why not? 'Cause then at least I can say I've done it. Plus, it's important for people to go out on a limb and take a new direction. It'd just be so boring if you didn't. How important was it to make a band record this time after basically making the first one yourself? I got really sick and tired of asking me if I was a solo artist. I always took offence to that. I don't fell I have the personality or charisma to become some 'solo artist'. If I wanna see a solo artist, I wanna see Gary Numan or David Bowie. You know, these people are freaks, they're weird. Just to have some average joe guy come out with a guitar, it's like who cares? But also, when we went out and started playing shows. I didn't stand on stage alone with a guitar. There were three other amazing people in the band. So it was a dream come true to be in a band with such talented musicians. So it was the only way we could have done it. You like being in a band. Thats important to you. Well, yeah. After Nirvana was over, I could've gone and played drums for these people, or those people, or I could've been a... session drummer or something. But there's something about being in a band. It's like being in a great relationship. You have these best friends that you get to share something really special with every night. It sounds corny, but it's true. There's something about being in a band, whether it's driving a van to the next city atthree o'clock in the morning, or drinking horrible 7-11 coffee, trying to repair eqipment when you don't know what you're doing, or doing TV shows. I mean, it's all fun. It's just this circus, like an amusement park ride, and you don't wanna get off. How have you felt about being the main guy in the band, especially in a creative sense? Have you felt any additional pressure or responsibility handling this role? Not really. See, I don't consider myself the main guy in the band. I'll come up with a verse-chorus-verse idea for a song and then say to everyone, "Is this okay? Should we tyr to elaborate and make this into something cool?" And then everyone throws in their two cents and we all arrange it and we all put it together. So it's a total collaboration. See, it's weird, because I do the interview, and because I take on a lot of the responsibility. I feel like I do it for everyone. I'm doing press and promoting this album because I want everyone to be comfortable and happy. I'm probably just the most hyperactive of the band and I can't, like, sit down and do nothing. It's strange because throughout the history of rock there's always been this need to put attention on one person in the band. Like there was Jim Morrison but there were the Doors, you know? There's just this need to pluck one person out and put them in the spotlight. But it's interesting that you say that because you come out of a situation where people thought Nirvana was Kurt Cobain, and you and Krist were just sidemen. But see - and now I'm contradicting myself - when you're in a band with someone like Kurt, who's and incredible songwriter... I mean, he was different than everyone else. He was very much in his own league or world. And with this band I just feel like we're all kind of, really, the same. There's a song on the new album called 'My Hero', and you've said it's influenced by Cobain. Is this something you had to wait for some time before dealing with? Actually, that song's kind of old. It was one of the first songs that we wrote together as a band. But really, the song deals more with the idolatry and hero-worship that people get caught up in. I didn't grow up wanting to be like the guys in KISS - I just thought they were sort of cool. But the people I considered heroes were just sort of ordinary people: You know, really solid, down-to-earth people that I had a lot of respect for. So it really smashes the whole super-hero, rock-hero, sports-hero thing because everybody's a normal human being. That's kind of what it had to do with. And I was referring to many people that I considered heroes throughout my life that are just, like friends: people I spend almost evry day with. Some of these people are my heroes just because I think they're so good!